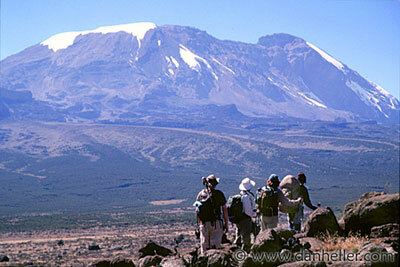 At 19340 feet, Kilimanjaro is the highest mountain in Africa. 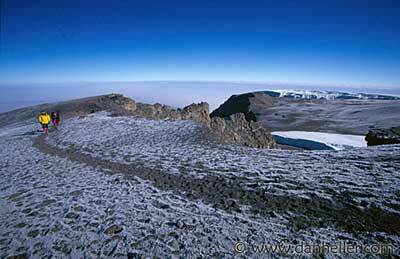 Most climbers attempt to summit it via the 3 to 5 day Mweka Route. Only about fifty per cent of climbers are successful at reaching the top. Altitude sickness is by far the biggest cause of failure. People simply don’t give themselves enough time to acclimatize. In order to increase my odds, I decided to take the longer and more scenic Shira route and I’m happy to say that everybody in my group made it to the top. My tent mate for the trip was a professional photographer. You’ll notice that I’ve “borrowed” a few of his photos. Mt. Kilimanjaro as seen from outside our lodge near Arusha. We spent the first day hiking through the jungle. Other than a few monkeys we didn’t see much in the way of wildlife. On our second day we were met on the trail by a group of armed locals. We saw our guide give them some money. He said that they would scout ahead of us for dangerous animals. We all believed, however, that he was paying off the men so that they wouldn’t give us any trouble. After a couple of days we were above the tree line. 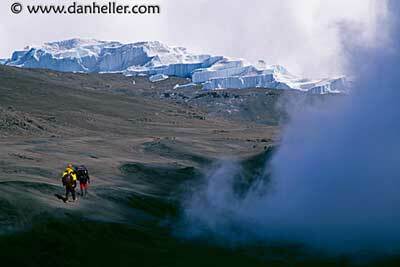 group and even a few porters began to experience altitude sickness. We spent a rest day at this camp to give us a chance to acclimate. I decided that it would be a good opportunity to clean up. I heated some water and tried to wash my hair in a bowl. I did a miserable job, however, and couldn’t get the shampoo out of my hair. I was left with with a sticky residue that seemed like a magnet for dust. I would have been better off if I hadn’t washed at all. During our rest day some of climbed to the top of the pinnacle. It involved a lot of rock scrambling and even some short stretches of rock climbing. Most of us regretted climbing it. At sea level it would have been no problem at all, but at 15,000 ft. it was exhausting. We were above the clouds for most of the hike. 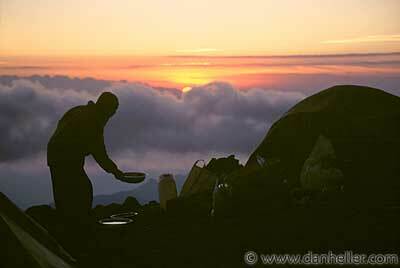 Cooking dinner at 16,000 feet. At this camp we were already nearly 2000 feet higher than anywhere in the contiguous United States. And the higher that you go the more of a problem that loss of appetite becomes. It wasn’t that I felt nauseous, it’s just that I found it increasingly difficult to swallow food — especially anything dry. Our guide nagged us continually and kept saying over and over again in a thick accent “Eat! Eat! you must eat. Drink! Drink! You must drink. Our camp just below the Western Breech. The next day we climbed straight up that wall in the background. It was a long day of hiking nearly straight up. Loose rock was also a problem. A man was killed in a prior group after being struck in the head by a rock that his team mate inadvertently knocked loose. 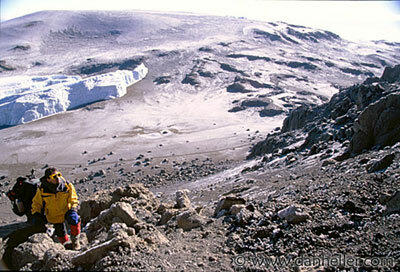 After scaling the Western Breech we reached a plateau with a large glacier on it. We camped just below 19,000 feet. I found it very difficult to sleep at that altitude. It has only fifty per cent of the air that there is at sea level. During the day I was able to force my lungs to take deep breaths and I felt fine, but you cannot force breathe while asleep and every time that I started to drift off I felt like I was about to suffocate. In the morning I felt light headed and dizzy. When I left my tent I found it difficult to maintain my balance and fell down after a few steps. We were only about 400 vertical feet from the summit, however, and I was determined to make it. Here I am making the final push towards the summit. Altitude sickness is a funny thing. You never can tell when it will hit you or how hard. There were climbers in my group that were so sick at 14000 feet that they were throwing up. By the time they had reached our final camp at 19,000 ft, they had acclimated. I, on the other hand, who had been fine during the whole the whole climb was now ill. I soon found the rest of the group out pacing me and I fell behind. It did allow Dan, however, to get this great shot of me struggling up the mountain. Here I am at the summit (19,340 ft). I felt relieved that I had made it, but didn’t want to move. A man pushed his camera at me and asked if I’d take a picture of him and his wife. I didn’t want to be rude, but standing was the last thing that I wanted to do. Luckily a team mate of mine intervened and grabbed the camera and took the picture. I was later told that my lips were turning dark from lack of oxygen. My guide gave me some steroids and told me that I needed to start down right away. Altitude sickness can be deadly. In fact, we later learned that a women died that very day on the mountain from altitude sickness. Going down turned out to be easy and we lost elevation quickly. An hour later I felt fine. One good thing about altitude sickness is that it tends to clear up quickly if you lose elevation. The last day was a long slog through knee high mud.